The Bitcoin trend remains up as it has spent the majority of the past 5-years inside of rising channel (1). Nothing of late has changed this long-term trend. 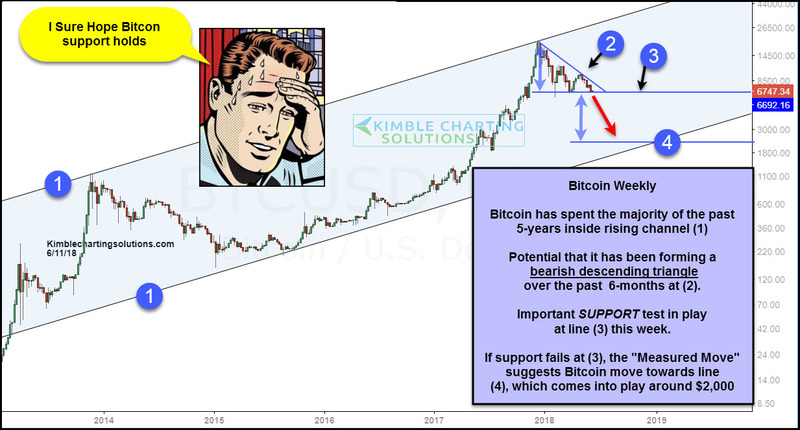 If support line (3) would happen to fail, the descending triangle measured move suggests that Bitcoin could head towards line (4), which is near the bottom of rising channel (1), which comes into play around the $2,000 level. As mentioned above, the trend on bitcoin remains up and it is testing support right now that has held two other times in the past four months. The Power of the Pattern suggests that the current support test is big time important for Bitcoin bulls!! !